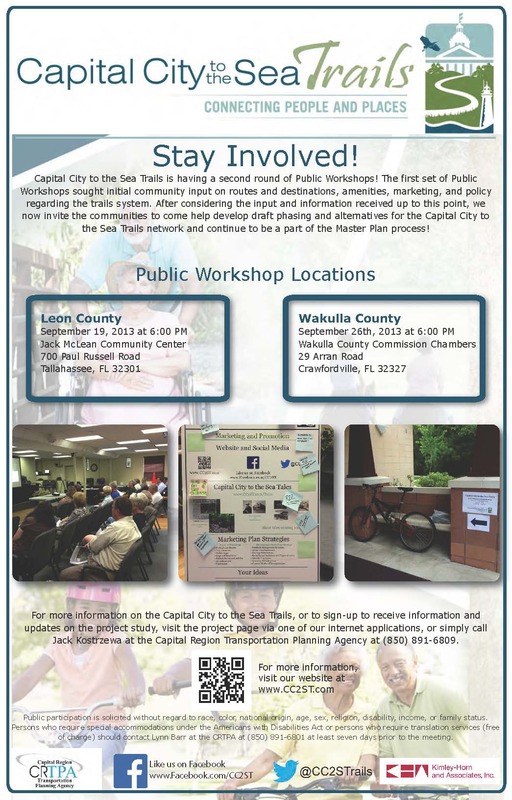 Capital City to the Sea Trails is having a second round of Public Workshops! The first set of Public Workshops sought initial community input on routes and destinations, amenities, marketing, and policy regarding the trails system. After considering the input and information received up to this point, we now invite the communities to come help develop draft phasing and alternatives for the Capital City to the Sea Trails network and continue to be a part of the Master Plan process! For more information, please download the Public Workshop Flyer. This entry was posted in Home and tagged Capital City to the Sea Trails, CC2ST, Public Workshop by artiewhite. Bookmark the permalink.